Figure 1. Kingdom Hearts videogame traversal. 29 sessions over 20 days, 62.5 hours total. 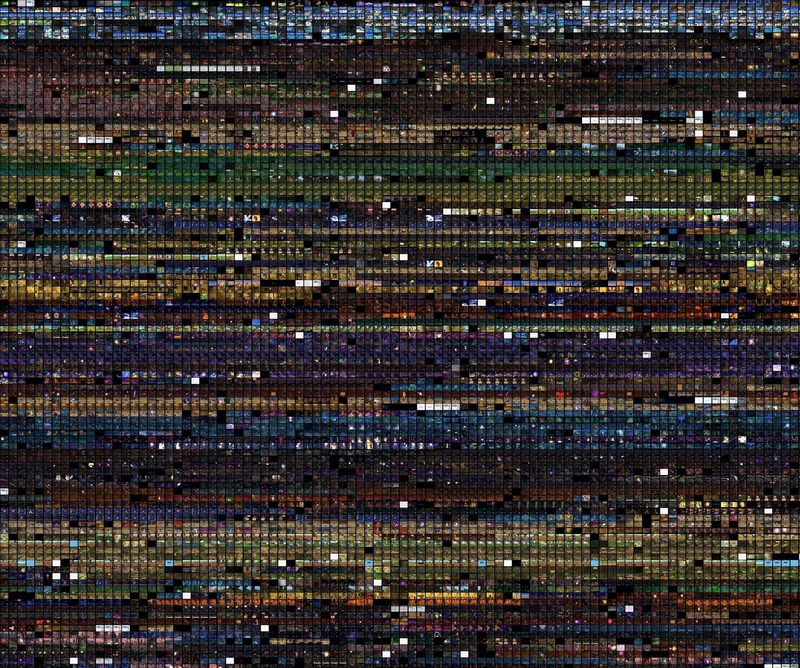 This visualization uses 22,500 frames. Detail (see full size image on Flickr). Figure 2. Kingdom Hearts II videogame traversal. 16 sessions over 18 days, 27 hours total. 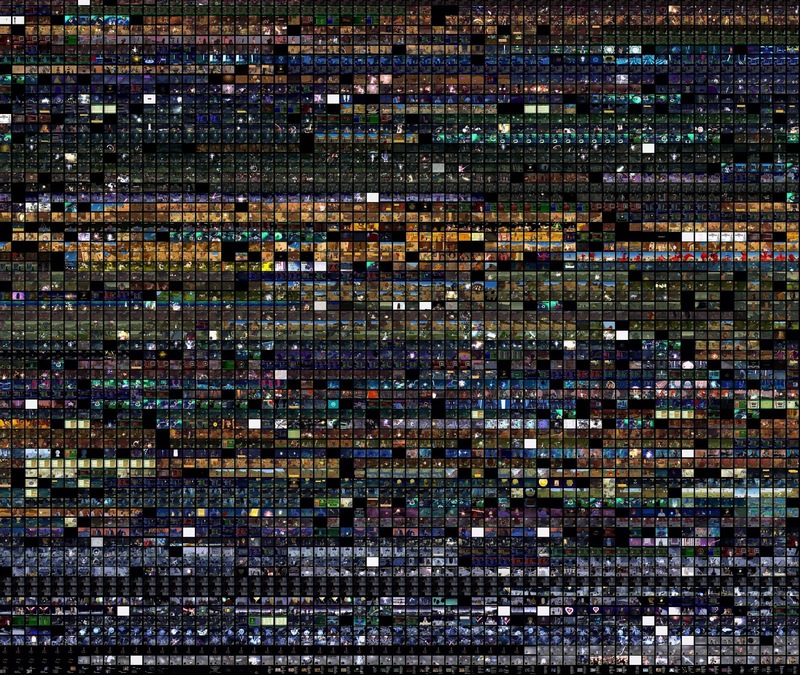 This visualization uses 13,300 frames. Detail (see full size image on Flickr). Close-up detail of Figure 2 (see full size image on Flickr). Figure 3. 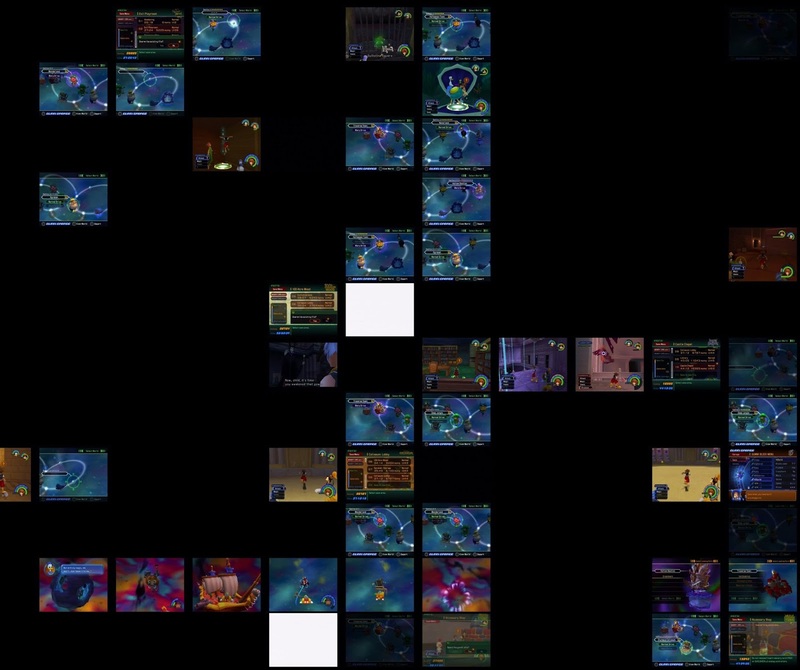 Sampled frames from the video capture of the complete traversal (playing the game from the beginning to the end) of the videogame Kingdom Hearts (2002, Square Co., Ltd.). Detail (see full size image on Flickr). See the entire video animation on YouTube. Detail of Figure 3 (see full size image on Flickr). See the entire video animation on YouTube. See the entire video animation on YouTube. This project (2010) represents nearly 100 hours of playing two videogames as high resolution visualizations. This representation allows us to study the interplay of various elements of gameplay, and the relationship between the travel through game spaces and the passage of time in game play. Data: The data are the game play sessions of the video games Kingdom Hearts (2002, Square Co., Ltd.) and Kingdom Hearts II (2005, Square-Enix, Inc.) Each game was played from the beginning to the end over a number of sessions. 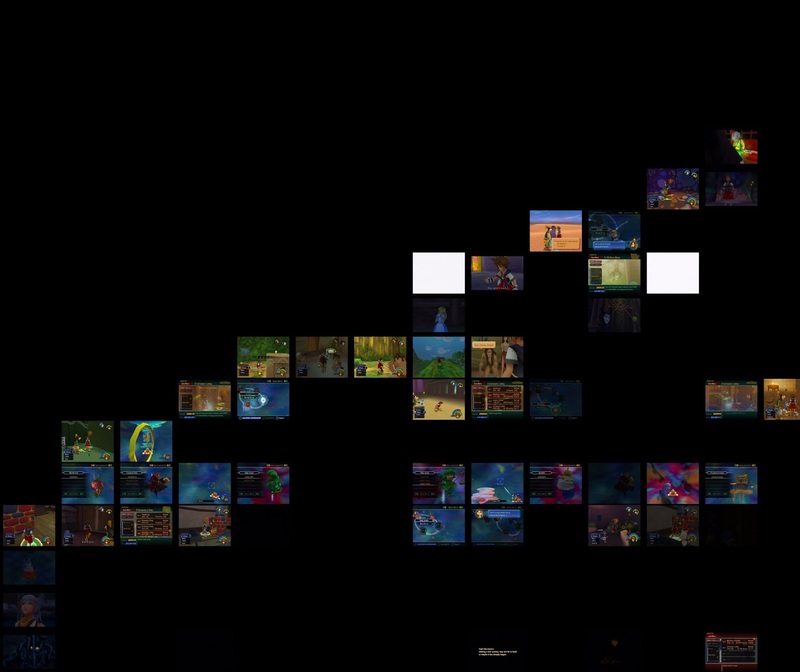 The video captured from all game sessions of each game were assembled into a single sequence. The sequences were sampled at 6 frames per second. This resulted in 225,000 frames for Kingdom Hearts and 133,000 frames for Kingdom Hearts II. 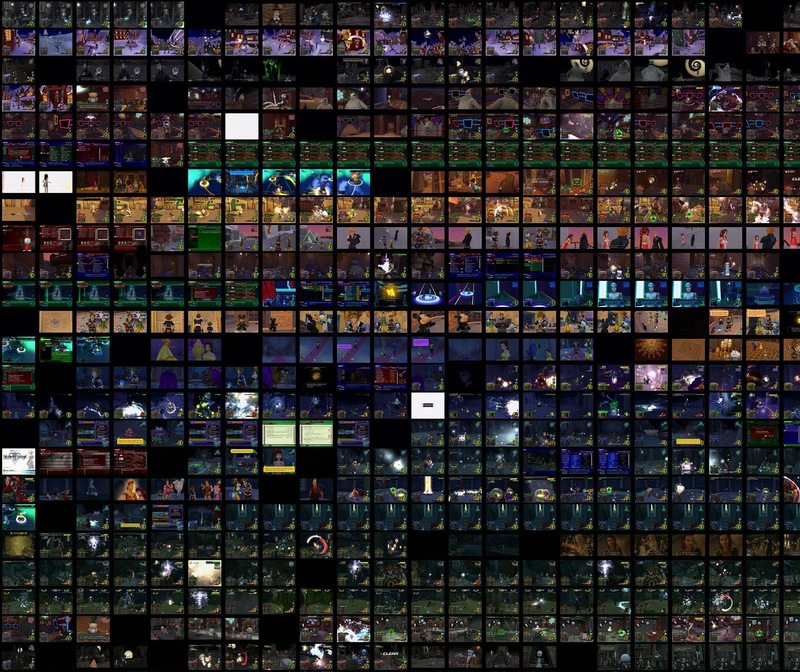 The visualizations use only every 10th frame from the complete frame sets: Kingdom Hearts: 22,500 frames. Kingdom Hearts II: 13,300 frames. This visualization highlights the telescoping mobility over the game-worlds over time: first, the player visits one world at a time. In the middle of the game traversal (sessions 18 and 19) the player freely shuttles between the worlds, flattening them and treating them as resources, rather than as narrative spaces.By animating this passage through spaces, we can see the experience of expanding mobility between them.